Sweetly scented and pretty with potpourri – make your own homemade bath oil. So easy to do, with ingredients you have at home! Clip two slips of dried eucalyptus to be slighter smaller than the height of your jar. If this is not available, you might substitute a sprig of baby’s breath or other dried ‘twiggy’ material to lend height and form to your floating floral arrangement. Insert each slip of eucalyptus into the jar. Add rose leaves, rosebuds, or your choices of dried fragrant potpourri flowers (lavender, lilac, lily of the valley, calendula, lemon balm, mint leaves etc.} Fill the jar about half full with potpourri selection. Add a few drops of fragrance oil or a spritz of your perfume. You might find perfume easier to add if you spray on the flowers first. Fill the jar almost to the cork line with baby oil. I used an inexpensive drug store brand that included Vitamin E and Aloe Vera as well, but plain mineral oil would be fine too. Cork or use the screw top, capping the jar tightly. You may wish to dip the cork in wax to seal to prevent any leaks. Add decoration to the neck of the jar. I used a bow made from raffia and attached three miniature wire-stemmed rosebuds. Alternatives would be narrow ribbon or curling ribbon. Print the gift tag of your choice from those shown below. Highlight with your cursor, go to “File” at the left of your computer taskbar, and find “Print” on the drop-down menu. Pick “Print Selection” and click. 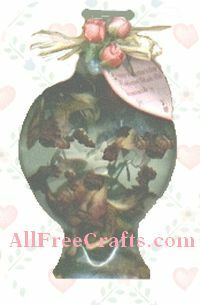 Cut out and attach the gift tag with a scrap of raffia or use the wire stem of one of the rosebuds to poke through the tag and secure. This basic craft can be adapted for many occasions. Use a recycled olive oil jar, or any jar that you think has an interesting shape or colour. Try adding tiny pine cones or small seashells to the potpourri for purely aesthetic effect. If using a cork stoppered jar, be aware that placing the jar on its side could cause leakage, so keep it upright for storage.